Would you consider those serving sizes a maintenance plan? 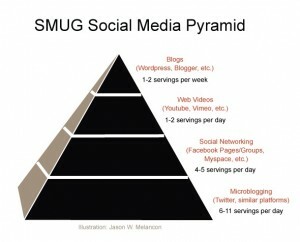 I see many in other non-health industries for example, getting more than their 6-11 servings of micro blogging per day. Their continued higher volume use is helping them grow like a weight lifter might be. These numbers, IMO, appear to be a maintenance diet. What might these numbers look like if you want to be the next Mr./Mrs. Universe? Great point, Erik. High doses of Twitter definitely can be a performance-enhancing substance. 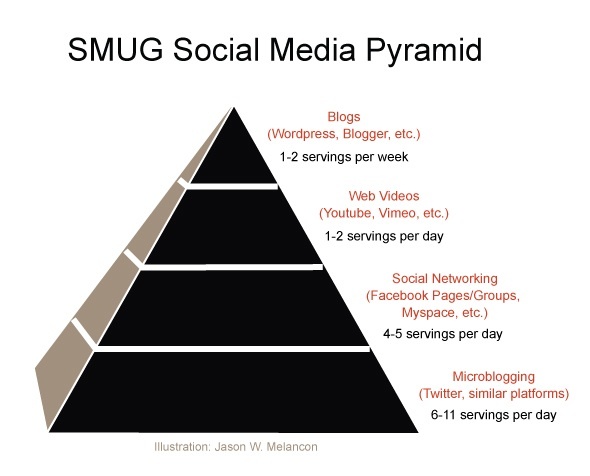 My goal with SMUG is to help people not be overwhelmed, so I suggest more manageable expectations. But you are correct that while overloading on breads, pasta and rice in the USDA pyramid likely won’t help your physique, massive doses of Twitter can help your social media profile. That’s with the caveat that you are tweeting about something useful and interesting to others. So yes, these are probably a maintenance plan…or a “don’t get freaked out as you’re starting” plan. Ahh, I see…now I better understand your portion sizes related to the RDA of social networking…excellent clarification! It’s a great way to think through frequency – I really like this analogy. A flip side of this line is thinking about overdosing – how much is too much? Or even malnurtirtion – how much is too little? I get ‘overfed’ from some of the friends/folks/brands that I follow, and then I unsubscribe/block/stop following. I think its good practice to think about the consequences in having too big of a portion, as well as too small. Interestingly, I think some of the risks of both are similar – alientating an audience, appearing disconnected etc. I love the idea but think your pyramid is bottom heavy. I think this encourages the useless Facebook and MySpace status updates as well as the “taking the dog for a walk” Tweets. I don’t think the average person is interesting enough that I need to know what they are doing every couple of hours. Even Aston and Demi have cut way back on their twitter assault. Thanks, John and Dana. I’m talking here mainly about people wanting to use social media professionally, to accomplish some business or organizational goals. Kind of like lima beans. Technically, they would count as a serving of vegetables, but they taste so bad they could put you off vegetables altogether. Don’t do “Lima Bean” tweets. Oh, come on now; lima beans are delicious! I just was pointed to this post by a dear friend of mine. It is spectacular. Quick question- where do you feel pinterest falls on the pyramid? Thanks, Kimmy. I think Pinterest is in the Facebook tier mainly because you can pin things without a huge amount of original creation. So in other words, you don’t need a video camera…you can just pin interesting articles or images to share. Slideshare.net, for instance, would be in the YouTube tier…because I call it YouTube for PowerPoints. You need to have presentation software like Keynote or PowerPoint to share at that level. Thanks for the question! Thank you for your reply. One more question (and sorry to pester)- I am just learning the art of social media for business but am an avid consumer of social media personally. Twitter irritates the hell out of me and I have trouble understanding it. However I am on facebook and pinterest all the time. Yet in an earlier comment (from years ago) you state “High doses of Twitter definitely can be a performance-enhancing substance.” Can you point me to some resources on how to use twitter effectively and what the benefits are? I so much appreciate your help! Check out the Twitter curriculum section here on SMUG.